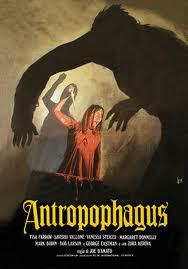 ANTHROPOPHAGUS is an especially nasty effort from the legendary director Joe D’Amato. 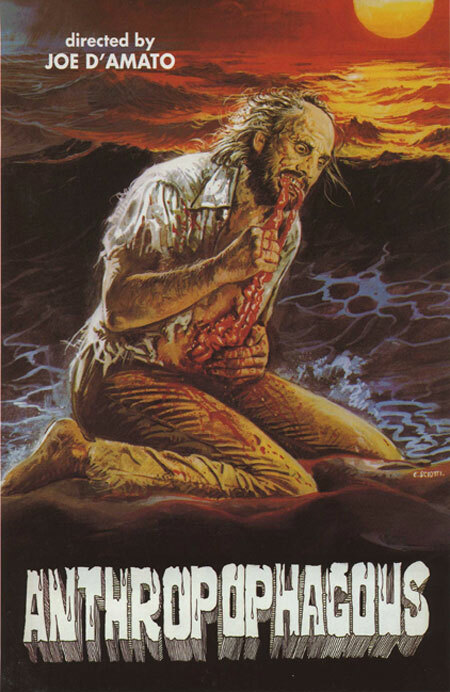 (aka Aristide Massacessi – RIP) It plays out much like an 80′s slasher flick, punctuated with graphic moments of explicit violence that are more in the vein of some of D’Amato’s previous efforts like“Beyond The Darkness” & “Emmanuelle And The Last Cannibals.” It wouldn’t be a stretch to call this a slasher flick with a zombie killer. Although the antropophagus isn’t an undead ghoul, he is very much alive and consumed with bloodlust. The most infamous moment in this flick has to be the scene where George chows down on a freshly removed fetus! A skinned rabbit was used for this effect and it is convincingly pukeworthy. The gory gut munching climax is also extremely memorable, and is usually splashed all over the cover artwork just to spoil everyone’s fun. Although the film occasionally suffers from a coffin’s pace, it never skimps on the splatter when the man-eater gets down to business. A few of the special effects are a bit less than convincing (the freshly severed head in a bucket is laughably fake looking) but that only adds to the fun. George is one scary looking dude, and the scenes towards the end of the film where he stalks after Tisa Farrow are pretty scary stuff. The minimal plot (most of the film consists of people walking around in the dark looking for other people) and maximum carnage can make this one an acquired taste, but gorehounds should certainly consider this a must see. This infamous horror film was indeed “nasty” enough to have been banned on video in the UK for over 18 years. 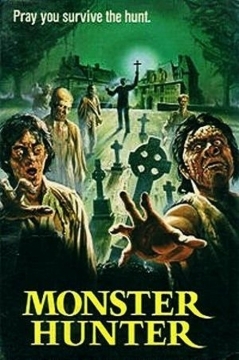 Several different versions have been released on vhs and dvd over the years, with multiple alternate titles including “Antropophagus: The Beast” (the UK video title), “Savage Island,” “Man Eater,” and “The Grim Reaper” (the original US video title). These releases were all butchered and castrated to suit the timid tastes of censors. 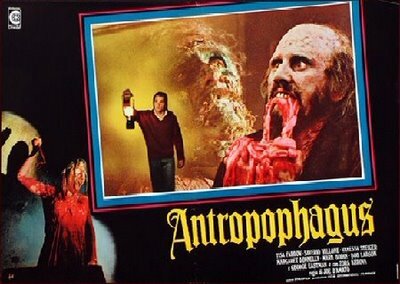 Fortunately for horror fans, the fine folks at Shriek Show were good enough to release a completely UNCUT version of ANTHROPOPHAGUS which was made from the original Italian negative. Shriek Show’s nifty two disc release includes a wealth of bonus features including a 67 minute documentary entitled “Joe D’Amato: Totally Uncut 2,” an interview with stars George Eastman and Zora Kerova, a photo gallery, and more trailers than you can shake a severed limb at. Highly recommended. Joe D’Amato & George Eastman teamed up again the following year to create a loose, follow up film (and unofficial sequel) entitled ABSURD. This time around George Eastman stars as Mikos, a monstrous Greek serial killer gifted with mutant blood that coagulates instantly and makes him almost indestructible. A priest played by Edmund Purdom (Pieces) chases the monster down and disembowels him. Mikos is sent to the local hospital, where he quickly comes back to life, snuffs a nurse with a surgical drill and then resumes his violent killing spree. The next victim is none other than future horror writer and director Michele Soavi (! ), who plays an ill fated biker. Mikos is only briefly sidelined after being accidentally hit by a Doctor’s passing automobile, and then sets his deadly sights on the Doctor’s family. The family’s two young children had been left alone for the evening, and come face to face with an all too real boogeyman, more horrible than anything they could have ever imagined! Despite the many obvious similarities, including of course the casting of George Eastman as the intestinally challenged monster-killer, ABSURD actually has nothing at all to do with ANTHROPOPHAGUS, and was not meant to be a proper sequel to that film. It stands out to me as more of an imitation of the American slasher flicks of the era, especially John Carpenter’s clas-sick “Halloween.” George doesn’t sport any creepy looking zombie makeup this time around, but he still looks pretty damned creepy while walking around in white tennis shoes. Much like the film that proceeded it, the horrible highlights of “Absurd” are the violent death scenes, which include George’s graphic impalement (sadly there’s no intestine eating this time around), buzz saws to the skull, and an extended gore sequence featuring a nurse getting a close up look at the inside of a gas oven. Fans of “Anthropophagus” who are hungry for more splatter should eat this one up. It’s also highly recommended for fans of gory 80’s slasher flicks. This film was released under multiple alternate titles over the years, including “Absurd,” “Rosso Sangue,” “Anthropophagus 2”, “Grim Reaper 2,” and “Zombie 6: Monster Hunter.” You can currently find it uncut on DVD under the title HORRIBLE from Mya Communication. The total lack of bonus features is a bummer, but the gory goodness contained within the film itself more than justifies a purchase. Buy or die! This entry was posted on March 20, 2013 at 5:47 pm and is filed under Uncategorized. You can follow any responses to this entry through the RSS 2.0 feed. You can leave a response, or trackback from your own site.